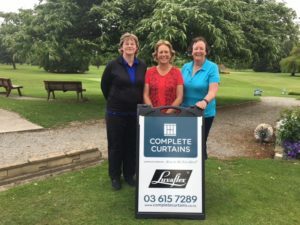 November, 2016 | Temuka Golf Club Inc.
S Twaddle & D Lovatt 62.5 K Manson & M Flett 65.5, L Stratford & Y Cook 66, A Stuart & R Alison 68. The Ladies Committee organised a great evening for members for the Closing Day of the 2016 season. The entertainment was the owner of Talbot Cheese who gave a really interesting talk on the development of his company and provided various cheeses for members to taste and spoke of the process required for individual cheeses. All enjoyed the meal along with the wine provided. Below photos taken on the night. 24-54 L Stratford, R Jones. Y McCully 34, M Dale, N Donoghue R Walker 33.